The Venerable Hakuyu Taizan Maezumi, Roshi, was the first Abbot of the Zen Center of Los Angeles and a major influence on the development of Zen Buddhism in the United States. As a major contributor to the transmission of Buddhist teachings to the West, Maezumi Roshi was instrumental in the formation of the Soto Zen Buddhist Association (SZBA) of American Soto Zen teachers. Maezumi Roshi also promoted exchange programs among priests and lay practitioners between the United States and Japan. 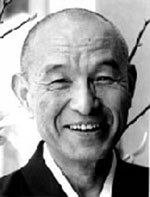 Born on February 24, 1931, Maezumi Roshi was ordained as a Soto Zen monk at the age of eleven. He received degrees in Oriental Literature and Philosophy from Komazawa University and studied at Sojiji, one of the two main Soto monasteries in Japan. He received Dharma transmission from Hakujun Kuroda, Roshi, in 1955. He also received approval as a teacher (Inka ) from both Koryu Osaka, Roshi, and Hakuun Yasutani, Roshi, thus becoming a Dharma successor in three Zen lineages. In 1956, Maezumi Roshi came to Los Angeles as a priest at Zenshuji Temple, the Soto Headquarters of the United States. He devoted his life to laying a firm foundation for the growth of Zen Buddhism in the West. In 1967, he established the Los Angeles Zendo which became the Zen Center of Los Angeles. Its honorary founder is Baian Hakujun Daiosho, who headed the Soto Sect Supreme Court and was one of the leading figures of Japanese Soto Zen. 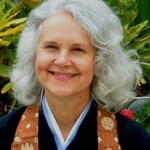 Nicolee Jikyo McMahon, RoshiNicolee Jikyo McMahon, Roshi, received Dharma Transmission from Taizan Maezumi Roshi in 1995. She began meditation practice in 1969, and started formal Zen study in 1980 at the Zen Center of Los Angeles. Roshi is a Marriage and Family therapist and she leads Zen retreats throughout the year. Roshi originated the ”Practice of Immediacy” © which integrates the arts — music, writing, poetry, and movement with Zen practice. She is married, and has two grown children, a stepson, and four grandchildren. She continues to be a student of skillful means to better assist those she works with in Zen and therapy.